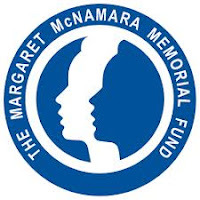 Margaret McNamara Memorial Fund (MMMF) has provided grants of $12,000 each since 1983 to women from developing countries who are currently studying in the United States or Canada. The grants are to be used toward the completion of a college degree. The grants are specifically for women 25 years old or older who are from a lower- or middle-income developing country attending a college or university in the U.S. or Canada. Women applying must have academic need and excellent academic credentials. In addition, they must have a record of being involved in activities that focus on improving the lives of women and children in developing countries. The fund was established by Margaret McNamara, wife of former Secretary of Defense Robert McNamara. She became interested in the lives of women and children in developing countries while traveling with her husband on World Bank projects in Africa. Asia, and Latin America. She received the Medal of Freedom award in 1981 for establishing the Reading is Fundamental program. The grants and other programs sponsored by MMMF are funded through donations from World Bank staff members, retirees and other public and private sources. The next application process will begin in September, 2013.